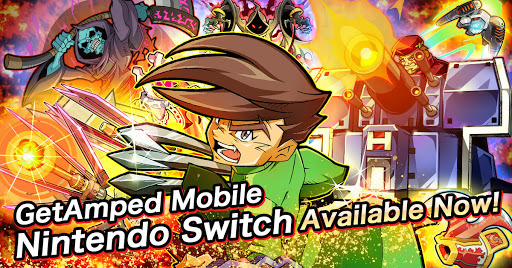 Tokyo, JAPAN - Jan. 18th, 2019 - CyberStep, Inc. is excited to announce the release of GetAmped Mobile for the Nintendo Switch on January 18th, 2019. The game can be downloaded from the Nintendo eShop. And an event where top ranking players can win thousands of dollars in prizes is happening now! GetAmped Mobile is the portable version of GetAmped, the popular online, fighting-action game with over 30 million players worldwide. Now it’s on Nintendo Switch, so you can bring the fun wherever you go! With numerous battle modes (Deathmatch, Team Match, Duel), you can fight with up to 4 players from all around the world. And the Skin Editor allows you to customize your character’s appearance however you like! During the event period, players will be awarded points based upon their ranking within their individual Deathmatches in-game. Points obtained during the event period will be tallied, and the top 200 players will receive Amazon Gift Cards based upon their rank! Moreover, each of the 200 players will also receive 5 gacha tickets and 10 of the in-game item 'Champagne'! ※The prize will be an Amazon gift card, or a gift card for an equivalent service available in your region. After the event period, players will receive an in-game message from the management team containing their rank and the prize amount won. Please follow the instructions in the message to receive your prize. ※Prizes must be claimed within 2 weeks of notifications being sent. Graphics aren&apos;t everything, but boy, does this game look ugly, Mobile port or not.